LED lighting is sweeping the industry, with numerous facilities upgrading to energy-efficient, low-wattage and aesthetically pleasing LED lights and fixtures. Despite the many advantages of LED technology, determining the correct dimming and control solutions for LED lighting systems can be challenging. Leviton controls provide effective and reliable solutions with an expanding range of control options for the LED market. LED technology is here, and Leviton controls are here to stay. What kind of driver does the LED system have? With this driver type, what are the options for control? Once you determine the driver type, you can move on to selecting the perfect LED control solution for your application. Leviton offers a wide variety of controls to meet all LED system types and application needs. 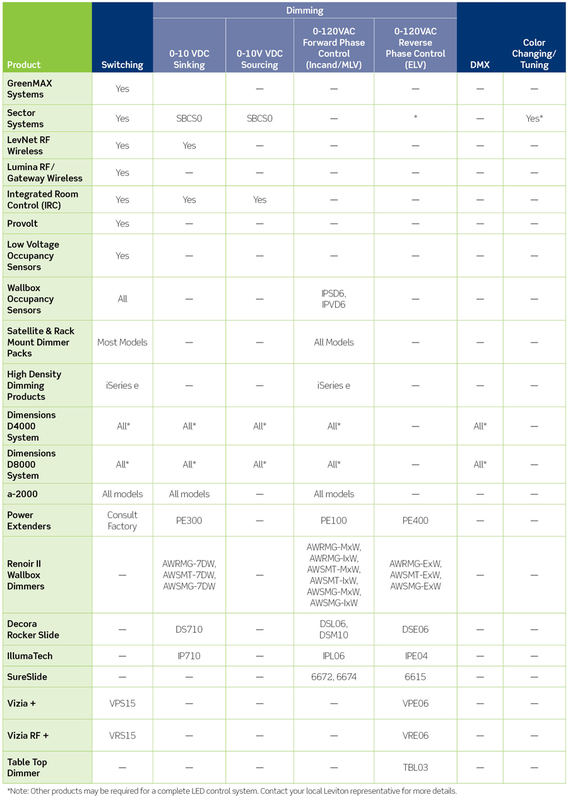 The chart below features shows all Leviton LED control options and the driver compatibility types. For more solution details visit our Leviton LED control website. You can also download our complete LED Solutions Guide for in-depth guidance through the system design process. For a list of commercial LED fixtures tested and proven to be compatible with Leviton controls, see our Fixture Compatibility List. Not seeing your fixture? Take out the guesswork with our commercial LED testing service! With selection tools and product solutions, Leviton is here to bring your lighting control into the energy-saving future.